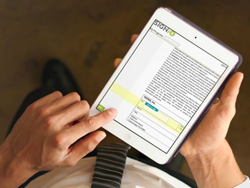 SIGNiX, the leading provider of cloud-based Independent E-Signature™ solutions, has confirmed that its e-signature technology is already compliant with the European Union’s new standards. SIGNiX, the leading provider of cloud-based Independent E-Signature™ solutions, has confirmed that its e-signature technology is already compliant with the European Union’s new standards for Advanced Electronic Signatures issued under its Electronic Identification and Authentication Services (eIDAS) Regulation. Under eIDAS, Advanced Electronic Signatures must uniquely identify and authenticate the signer of a document via a certificate authority (an organization that is trusted to sign digital certificates used to identify and authenticate an e-signer). The process must also timestamp the signature and tamper-seal the document. SIGNiX’s Independent E-Signature™ technology—which are true digital signatures (a specific type of electronic signature) using public key infrastructure and certificate authorities—is already compliant with the EU’s new rules. SIGNiX’s comprehensive audit trails and tamper-evident technology also meet eIDAS standards. The EU’s eIDAS regulation was adopted in 2014. Its trust services rules, which hold the new guidelines for electronic signatures, go into effect Friday, July 1, 2016.